Preparation for exams should begin earlier than the day before the test. You can’t cram an entire unit of information into an all-nighter. Get started at least a week before the exam. Begin by making yourself a calendar outlining a daily schedule of topics for review. Cover a small amount of material for each class each day. Every time you complete a topic, give them a mini review. Once you have decided what they need to study and how much time they need to spend studying, it is time to actually study. One of the best ways is to make succinct outlines. 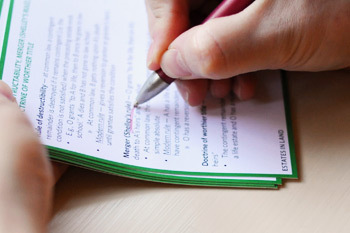 As they read over your textbook and class notes, write a brief summary for each topic. Highlight the areas in their outline that were most troublesome. When you have finished with all the material, they will have an outline they can review. Similar to outlining, making flashcards is a really helpful technique for studying. By writing down the information from their outline, you are already doing half the studying. Once the flashcards are complete, they will have a portable study packet to look over. If they are having trouble memorizing something or a particular concept is just not sinking in, get help before it’s too late. Ask your teacher to go over a glitch they might be having. Or if memorizing 200 vocabulary words seems like too much to do, recruit your family members to quiz them with index cards. They need at least seven hours of sleep a night to function. Tests are designed to make you think. If they are sleep-deprived, they won’t be able to remember any of the information you worked so hard to cram into their brain. Do not panic at the exam! Even if at first glance the test is overwhelming, remember to breathe. If a question seems too hard, answer all the questions they know, then return to the ones you left blank. Remind them that they are prepared. They have spent at least two weeks studying, so what’s another couple of minutes? Work through the exam slowly and read all the questions before answering them. If they are done before the time is up, look over your answers. Don’t let panic overwhelm them. Even if they think they've bombed the exam, worrying will not change theirscore. It may, however, affect their mindset for their next final. Zone out the last test and stay focused on the next one. Odds are, they didn’t do as badly as you think. Dont Hesitate To Ask For Help!